New name, same great people, same great service! 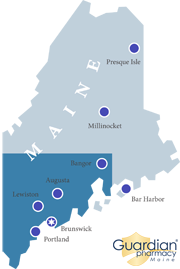 To celebrate 10 years as part of the Guardian family, Maine’s largest privately-owned long-term care pharmacy is changing its name and look! Waltz Long Term Care Pharmacy is proud to announce its official re-brand to Guardian Pharmacy of Maine. What this means for our existing customers and residents is simple – It’s business as usual. We will continue to provide friendly, accurate and timely service to meet any medication needs. Our phone numbers, street address, staff and service will all remain the same. Our mission also remains unchanged, as we will continue to strive every day to improve the lives of the individuals we serve, as a locally-owned business.